A preliminary design for the main entrance of our new church, which was created by Mission Builders. A Vision for a New Church! On Sunday, March 3 and Sunday, March 10, members of our church gathered together to discuss the direction of our church. It wasn't always easy, but the discussion was heartfelt and all the comments and input was important. At the end of the second meeting, a historic vote was taken on the future of Resurrection Lutheran Church. It's been 15 years since we purchased the property on NW 10th St and there was strong agreement that the time has come to move forward; we made a decision to build a new church on that property. We are envisioning a bright future with God at the center—a future where we can reach out and better serve our community. We will have better facilities for our youth, a separate entrance and indoor play area for our Mother's Day Out program, better storage and work areas, and a sanctuary designed so that it can be enlarged in the future as we grow. It's all very exciting. ​This vision will take all of us to make it a reality. We are at the beginning of the process, but a building committee will be formed to help lay out next steps and a solid plan. To accomplish this, we will sell part of our property on NW 10th and we will sell our existing facility. We will also do fundraising and we will obtain financing for the remaining balance. Our current church is 12,672 SF. The preliminary design for the new building is 28,372 SF. The estimated cost for the new church is $3.5 million. 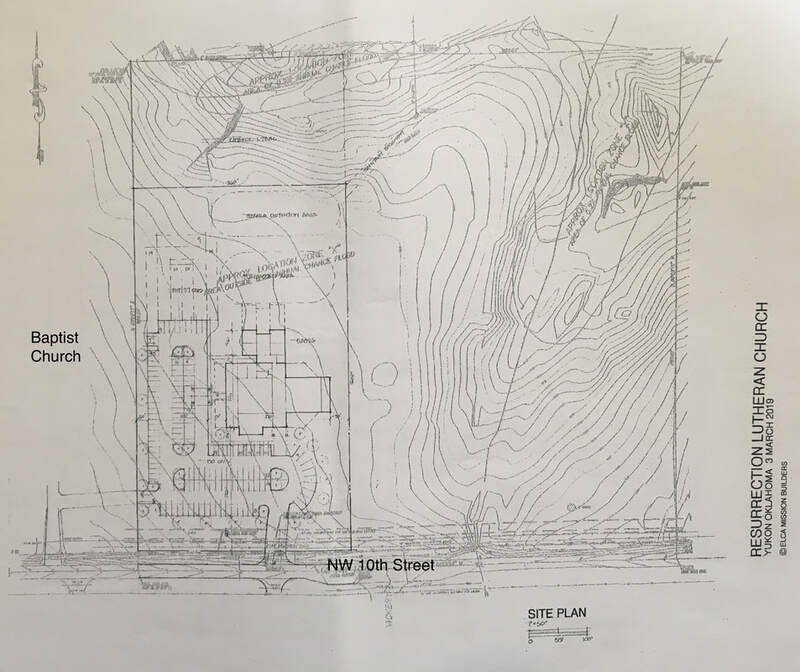 Proceeds from the sale of part of our land on NW 10th (we have paid it off) and the sale of our existing church will pay for part of it (Depending on how much land we sell, this could give us as much as $1.5 million). We will also do fundraising and we plan to obtain financing to cover the balance. Mission Builders, in thankfulness for all God has provided, use their God-given skills to help ELCA congregations, schools, camps and social ministry organizations construct or improve their facilities. While their hands do God’s work and provide housing for ministries, their hearts and voices share their faith and build up the body of Christ. Mission Builders build with local members of congregations, schools, camps and social ministry organizations. A typical project includes the Mission Builders, members of the congregation or organization and various other professionals from the community working side-by-side to improve facilities. 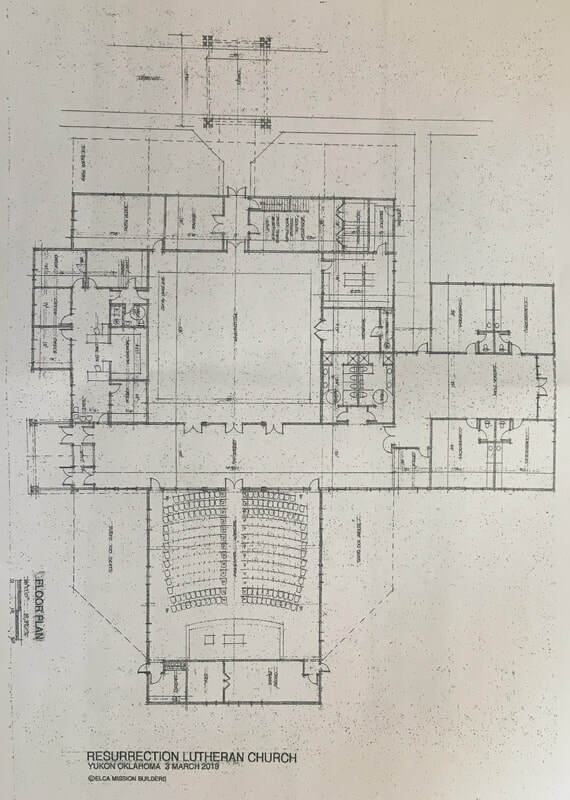 After analyzing RLC's needs, Mission Builders presented this floor plan to the church on March 3. Some changes will be needed, and we will need to fine tune it, but it gives us an excellent starting point. On March 31, the RLC Council voted to sign a six-month contract with Thomas Lay Realtors to list 9.44 acres for $475,000. In this preliminary plan, you can see that the church would be built on the far side of the property, which is a desirable location. Part of the property, including the wooded area will be sold to help finance it. To begin with, we plan to have three committees: Building, Finance and Fundraising. How do you want to help? -Building Committee: this committee is being formed to start the process. Steven Tharp is chairing the committee. -Finance Committee: Paul Francel is chairing the Finance Committee. -Fundraising Committee: We are still looking for a chair for the Fundraising Committee. If you are interested in serving on one of the committees, please step forward. Help design a bright future for RLC.